A few years ago I used to work at several college and departmental libraries at the University of Cambridge. One of the tasks which library staff regularly had to undertake was to cross reference the latest copies of all relevant reading lists with their collections, to ensure that they had copies of all the books that their students and staff needed. When I was there, the libraries would print out copies of the PDF reading lists published by the departments and then go through each list with a pen or pencil, searching for each item in the catalogue and then ticking it off if they had it. Given that there are over 100 libraries at the university and over 100 faculties and departments which produce reading lists, that adds up to a lot of library staff time. 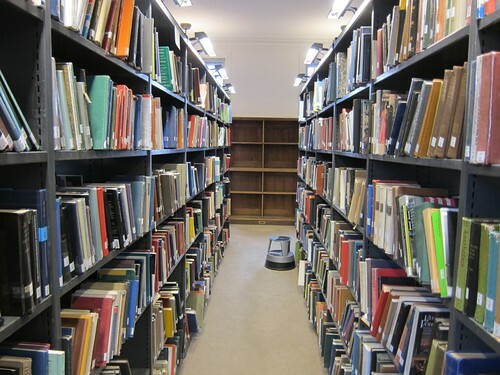 While I was there I volunteered to try to devise a way to make it easy for departments to create machine readable reading lists, which would mean that the process of cross-referencing them with library information systems could be automated. Then librarians could spend more time doing things that computers couldn’t do – like getting to know their users and their collections. This received a luke-warm reception from other librarians I spoke to. I had an extended correspondence about this with a systems librarian at the Cambridge University Library, who was keen but busy. I also wanted to link to digital copies of texts which had entered the public domain – either from within the library catalogue or via an ancillary service – but curating and promoting access to freely available online resources (as opposed to subscription based resources) was not considered to be part of the librarian’s role. Now, years later, I’m very keen to make it easy for people to create and work with machine readable reading lists using TEXTUS, an open source platform for working with collections of texts which is currently being funded by JISC. In particular I’d like to pilot this with OpenPhilosophy.org, to try to create more machine readable versions of reading lists from philosophy departments in the UK. In this first instance, this would enable students and staff to easily find freely available public domain works which they could read on their computer or device, annotate and print out. In the future, with the help of some clever scripts, it would enable them to find copies of key texts in their local library, or in other libraries. In both cases lecturers could provide students with a single URL for their reading list, which would help them to find copies of the works they need that are scattered in a variety of digital and physical locations. To make this happen I’d propose working with students and staff in philosophy departments to create machine readable versions of their reading lists. Once we have these, we can start to match them to digital copies and experiment with scripts to run against university library information systems. If you’d like to participate in this as a student, lecturer, or librarian, or if you’re just generally interested in making this happen – please do drop me a note. This entry was posted in digital, digitalhumanities, humanities, ideas, open data, openknowledge, openphilosophy, projects, technology, textus. Bookmark the permalink. Comments are closed, but you can leave a trackback: Trackback URL.